"The Chelsea Dental Group provides a calming environment...I feel valued at all times." "The staff was professional and friendly. I am choosing to have more work done there." "...my nerves were immediately put to rest when I met Dr. Vu...Highly recommend." "These people understand how busy life is. They had me in, out, and smiling before I knew"
"Dr. Vu and her staff are super nice and she takes the time to deliver great service"
"The staff was cheerful and attentive. 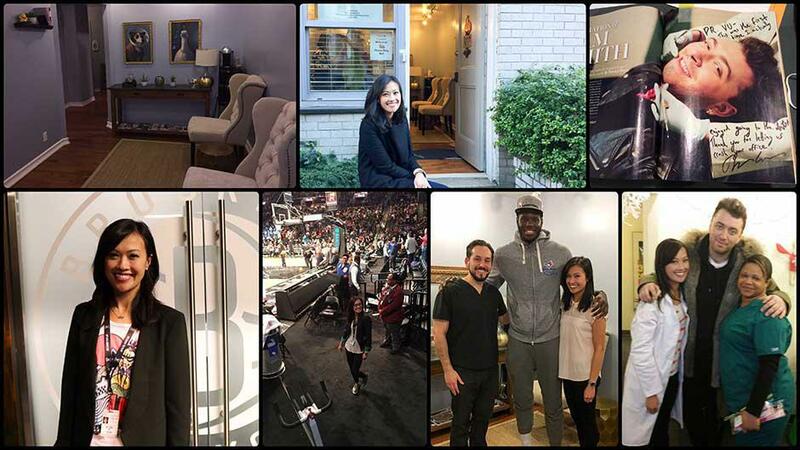 I love the coziness of the office"
Dr. Pauline Vu is a leading provider of general and cosmetic dentistry throughout New York City and the Chelsea area. She is a member of the American Academy of Cosmetic Dentistry and an Associate Fellow of the World Clinical Laser Institute. She is also currently part of the Medical Staff of the Brooklyn Nets serving as their Official Dentist. A New York native, she received her Bachelor’s of Science in Biology from Wellesley College and obtained her Doctoral degree in Dental Surgery from the New York University’s College of Dentistry in 2009. She went on to complete her residency at Montefiore Medical Center. Dr. Vu has committed herself to upholding the highest standards of dental care for all of her patients, whether they are visiting the office for a routine cleaning or a complex restoration. She prides herself on always seeking to offer the latest technology and highest quality materials available. She also works with some of the best lab technicians in the country to ensure the most aesthetic results possible. At Chelsea Dental Group, Dr. Vu embodies her mission statement of providing comprehensive dental care which caters to the needs of each unique patient. Dr.Vu also helps to reassure patients who are apprehensive about visiting the dentist and offers options designed to reduce their stress and help them relax. The practice and support staff strives to make our office comfortable and friendly for every patient. Patients describe Dr. Vu as professional and compassionate in addition to excelling at specialized dental care such as periodontal and endodontic procedures as well as being a gifted oral surgeon. Dr. Vu and the practice welcome all new patients. The Chelsea Dental Group also accepts most major forms of dental insurance. When she is not working with the NBA or practicing dentistry, Dr. Vu enjoys spending time with her family and friends. Her hobbies include reading, watching sports, and baking. Always seeking to improve the patient experience, Dr. Vu and the Chelsea Dental Group proudly use the WaterLase iplus 2.0 by Biolase—the leading technology in laser dentistry. The use of dental lasers allows for convenient, anxiety-free, and virtually painless procedures, ranging from simple fillings to more extensive gum and periodontal surgery often times without the use of anesthesia. We accept most commercial insurance providers. For more information, please call our office. "Dr. Pauline Vu is fantastic. She is informative, relaxing, and light-hearted...Her staff is cheery and easy going and I always walk out with a...smile on my face." "Dr. Vu always makes me feel special, managing to remember discussions we had at my most recent visit...I highly recommend Dr. Vu and her team..."
"Great place and great staff. Wonderful service and extremely helpful staff. Highly recommended! Love Dr. Vu too!" "Dr. Vu is sweet, and she's got such a cute office! I think I'm probably a difficult patient at times, but if the staff think so, they never show it."